In his module I provide an overview of the resources provided by CQ Almanac and provide some ideas about ways in which it could be used in a high school classroom. With so much in-depth information teachers and students in a High School setting may think this resource too abstruse to use practically. However, I think there are many focused ways it can be used which will greatly enrich a learning experience. Students in a U.S. History course will be able to track the civil rights movement from a legal perspective as someone who was following the news in the 1960s would have been able to. A student who is doing a guided research project on the controversial issue of abortion can easily see how feelings and legislation have changed over the course of the last fifty years and understand the debate as a successor to the birth control debate of the 60s. A guide to use the Congressional Quarterly Almanac Online Edition would be vital to help teachers find an easy way to fit its plethora of data into their lesson plan. This module hopes to provide just that, a quick easy guide to CQ Almanac Online in order to increase its usage in the classroom. 1. One of the less useful tools is located right on the front page the “Browse by Table of Contents” section. This section is really only useful for those who know they are looking for data on a specific Congress, not for those who are using the site for more exploratory purposes. 2. The “Browse by Topic” section is more useful for exploration, but only marginally so, as you have to choose the year after choosing the topic. Once again this could be very intuitive for someone who know what they are going to study in a research project however. 3. The “Series Appendix” section may be the most intimidating of them all. Some prior legislative knowledge is required to even make sense of the links contained in this section. Some of this information would only be useful for college level quantitative research in legislative studies (The “Floor Votes” subhead has more data than a high school student would ever need), but some interesting information for high school can be teased out. The section on “Presidential Support” gives some demographic and context information on presidential elections, which could be helpful to students outside of the realm of legislative studies. The section on “Presidential Messages” is broken down by president and contains State of the Union addresses, messages to Congress (support of bills), messages concerning vetoes, and other general presidential speeches and conferences. These primary source documents can give students a real feel for the period as they will be able to relate these presidential messages to the kind of information they hear from our President in the modern age. 4. This top bar with shifting images contains summary information on any given decade that the almanac has been published. These pages can be useful for students looking to get a political summary of what happened in a given decade and what was particularly important. These pages are definitely geared towards an exploratory kind of research. 5. The “Policy Tracker” option found on the left sidebar of the page is one of the most useful and fruitful tools to use for high school students. Most of the previously mentioned tools are good to help teachers find primary source documents in order to enhance their lessons, but a high level government or history class may be able to make use of this tool during research projects. The Policy Tracker has much more specific categories for legislation and pulls up all the relevant CQ data from across the span of the years of publication. For example, if a student group was doing a research project on changes in campaign finance legislation they would be able to click on the “Campaign Finance” sub-head and get all of the data (CQ articles, bills, campaign receipts, etc.) related to the topic. Some of this data is still a lot for a high school student to trudge through, but the intuitive nature of the “Policy Tracker” tool is great to help student find out more about a specific legislative topic or see their research topic throughout the years. Once you click on the Policy Tracker option on the sidebar you are taken to a seemingly overwhelming list of topics that you can follow. These are far more specific than the “Browse by Topic” content areas mentioned earlier. For example, you can do more than just track “Agriculture” you can track “Agriculture Price Support and Subsidies” or “Agriculture Insurance.” If you were interested in the legislative history of agricultural subsidies you could explore this further by clicking on it. You are brought now to a page with a list of documents that have been tagged with this specific policy area organized by year (you can change this ordering to alphabetical if you so desire). Here you can begin the actual meat of research and exploration into the topic area which you have selected. Most of the documents that come up in this policy area are narrative articles from CQ at the time which references (and links) the primary source documents of Congressional bills, laws, and Presidential messages. In addition, there are some practically useful functions on the left sidebar. Users are able to go back through their viewing history to see what documents they have pulled up. You can also add a document to you “favorites” and save searches in order to more easily access topics of particular interest and to make sure you don’t lose important sources you were planning to use in a lesson. CQ Alamanc, being a resource mostly used by colleges, has many more examples of college classroom application than of high school application. This first example, though drawn from a Princeton Government Seminar Syllabus, could easily be modified for the high school classroom. Here the professor cites CQ Almanac as one of the places to start while pursuing a research paper on policy in Congress. A high school version of this assignment might come in an AP Government class research paper that asked students to choose an issue of legislation and analyze it. Guiding them to CQ Almanac would be a great enhancement for the lesson. Most importantly in this example, the teacher would let students loose on CQ Almanac, allowing them to struggle with the tool for research after their initial guidance. For example, this assignment might be better adapted to high school if students were asked to choose one Congressional issue of interest to them that has been resolved through the passage or rejection of a bill. They would then use the CQ Almanac (and any other resources a teacher would see as fit) to track the history of this issue and explain in what way it was resolved and why this was the ultimate outcome. This assignment would include an exposure to legislative history and an introduction into some of the forces of political power that are at play on Capitol Hill that can lead to the passage or death of a bill. This lesson, while not utilizing CQ Almanac directly uses a site called CongressLink. This teacher has students explore the resource in order to better understand the role of Senate and House committees and sub-committees. 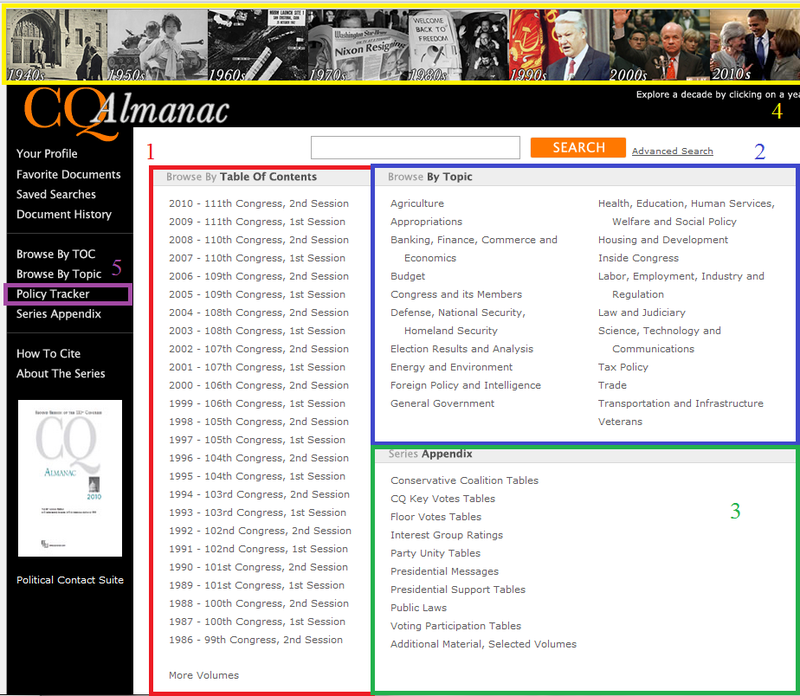 The “Browse by Topic” function in the CQ Almanac allows students to do much of the same work in understanding what kind of legislation passes through each committee. In addition, students could use the “Policy Tracker” in order to see what committee legislation that they found interesting has passed through. While the CQ Alamanc is more complex than CongressLink an exploration into the jurisdiction and importance of Congressional committees is possible through both tools. Students, in this lesson, are asked to draft a bill in a topic area of interest and then go through a mock committee debate using their bill, to help them understand the value of compromise. The format of the bill is provided, but the lesson would be greatly enhanced if students had access to the format of actual legislative bills. Students would also be able to better craft a bill for their topic area if they had an understanding of the history of policy on the bill. However, this lesson may help students most if the teacher found examples of bills and guided students through the “Policy Tracker” as opposed to letting them explore the CQ Almanac on their own. This lesson hopes to teach the Vietnam War through the lens of the debate between those opposing the war and its proponents. The lesson contains some primary source documents (Nixon’s address and John Kerry’s testimonial) both of which could be found on the CQ Almanac. Here the tool is used to help this instructor find documents to use in order to engage the class. If any teacher thought it fitting, they could go beyond the documents outlined in the lesson plan and find more related to the antiwar movement in the Almanac. This function is probably the most impressive and fruitful for teachers and students. This lesson could be used with regard to any controversial issue. If a teacher finds a key issue on which there is substantial debate, such as the development of affirmative action, they can use CQ Almanac online to find sources which argue for and against the issue. Students could be assigned groups in the form of a Structured Academic Controversy (SAC) and have to debate the issue based on the documents which they read. A lesson like this would enhance their ability to interpret sources and form persuasive arguments using evidence. There are many positive attributes to usage of CQ Almanac Online in the classroom. This resource has a comprehensive collection of data on all Congressional activities from 1945 up to the present. Our legislative branch has had a hand in most important events in American History for these last sixty years and, therefore, almost every historically important event found in this time frame can be found in the CQ Almanac. The intuitive nature of the policy tracker makes any project where you are following one issue throughout the last half of a century much easier. Finally, this resource puts students in the shoes of people from the period observing important legislation being debated allowing a much more tangible understanding of history. Many of the constraints of this comprehensive online resource come from practical, rather than content-based complaints. It is first important to mention that it is not free to use. Many Colleges seem to have subscriptions to Congressional Quarterly for research, but the same cannot be said for high schools. In terms of exploring the website, it would be useful to sort by type of document in addition to year and subject area. This way if a teacher or student only wanted to view primary source documents about Civil Rights, or speeches about civil rights, they could do so. Some other constraints are simply in the nature of the resource. While the website has vast resources from 1945 onward, there is much of American history that is missing. Also, the resource only sees history through the eyes of legislation (and sometimes through the executive) and it is important for students to understand there are multiple perspectives. Finally it is important to note that this is a high level source; though it is rich in information it will not be appropriate for every high school classroom and may require quite a bit of guidance. 1. CQ Almanac can be a resource for students, but it is, first and foremost, a resource for teachers to help them find relevant documents for discussion or to enrich a lesson. I wouldn’t send students to the site on their own unless they were doing a high-level research project. 2. If you do send students to this source on their own make sure to give them similar guidance as to what is provided in this module, it will be helpful for them to hone their research and find exactly what they need. 3. Make liberal use of the “Policy Tracker” function. The website is rich with resources and the policy tracker helps sort them in an easy and intuitive way for those who have less time for exploration. 4. As in the classroom example of a mock legislative debate, think about ways that having actual documents from Congress and literature about congress can help enhance student learning. 5. Use the controversy of modern issues like abortion and guns rights to your advantage when tracking policy in these areas. As these are heavily debated issues the documents concerning them can be great fodder for structured discussion. 6. Check to see if a local library or college campus has access to this resource in order to avoid the constraint of having to purchase a subscription or convince a school district that subscription would be worthwhile.